New to eLearning? If so, there are some things it helps to learn sooner instead of later. But don’t worry, they’re not hard to pick up. Get a handle on these three and you’ve pushed yourself ahead from complete novice/deer in the headlights to someone who’s not lost in conversations with eLearning developers, trainers, and instructional designers, and other folks who talk about online training. Nice! Once you’ve got these three basic terms down, feel free to move on to our Online Safety Training Glossary to learn even more (most of the terms apply to all online training, not just safety training). PLUS, you can read (or watch a recorded webinar) to learn how to use an authoring tool to create an eLearning course in SCORM format and then import it into a learning management system (LMS)! Here are three good things to know before you walk into a conference room with a bunch of online training professionals and they eat you alive for not knowing the tools of their trade. A learning management system (LMS) is a software system you can use to administer a training program. Although an LMS CAN be and often IS used with eLearning courses, it’s a very common misconception that an LMS can ONLY be used with eLearning. But that’s not the case–you can use an LMS to administer instructor-led training, task-based skill demonstrations and evaluations, and more. 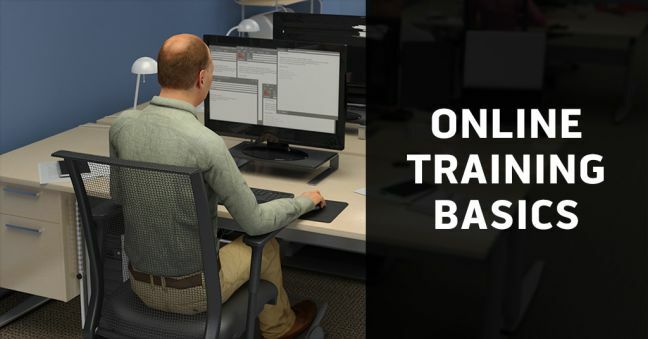 Read more about how an LMS can be used with instructor-led training here, for example. If you’re still curious, click to read more about learning management systems, or watch our 2-minute Convergence LMS Overview video. You may think that only big, fancy eLearning providers can make eLearning courses, and you’re only option is to buy eLearning from them. But again, not true. Au contraire, mon frere! Authoring tools are software applications that let you create your own eLearning courses. Many allow you to start with a simple PowerPoint presentation and add multimedia, interactivity, and quizzes that you add to that “starter” PowerPoint presentation. You can include your own site-specific information, create your own quizzes and tests, set you own passing scores, and then import your own self-created eLearning course into an LMS to assign it to your workers. For more about that, click to read more about authoring tools. Or watch our 60-minute recorded, on-demand webinar that shows how to use an eLearning authoring tool to make your own eLearning course (below). You can read even more about choosing and using eLearning authoring tools here. In ancient days, when sailors, travelers, and wanderers wanted to communicate with others around the globe, they’d often learn the lingua franca: the language spoken by many throughout a region or the world. For example, today English is a lingua franca, and one imagines Chinese will be one too some day if it’s not one already. I copped that definition from Wikipedia in case you’re interested. Or, to put that another way, SCORM-complaint eLearning courses and LMSs are “plug and play” and ready to go. Amongst other things, that means you can buy a SCORM-complaint LMS from one company, and SCORM-compliant eLearning courses from another company, and they’ll work together. Or, you can buy a SCORM-compliant LMS from one company, get SCORM-complaint eLearning courses from another company, and then use an authoring tool to make your own SCORM-complaint eLearning courses, and they’ll all work together. As you’d imagine, this is very handy. If you’re still curious, click to read more about SCORM. If you’re still curious, we’ve got some additional articles for you below. Is an LMS Only Good for e-Learning? Nope. Do You Need an Authoring Tool to Use an LMS? Nope. What Is Online Health and Safety Training And What Can It Do? Also: Learn more about the learning management systems (LMSs) by Convergence Training. Actually, the only SCORM article we’ve got for ya is that one we linked you to earlier. Here it is again: click to read more about SCORM. Check out our Online Safety Training Glossary. A few terms are specific to safety training, but most are general and apply to all online training. That’s all we’ve got for you today. If you’ve got other questions, or if you’d like to add more information, please drop a line in the comments section below. 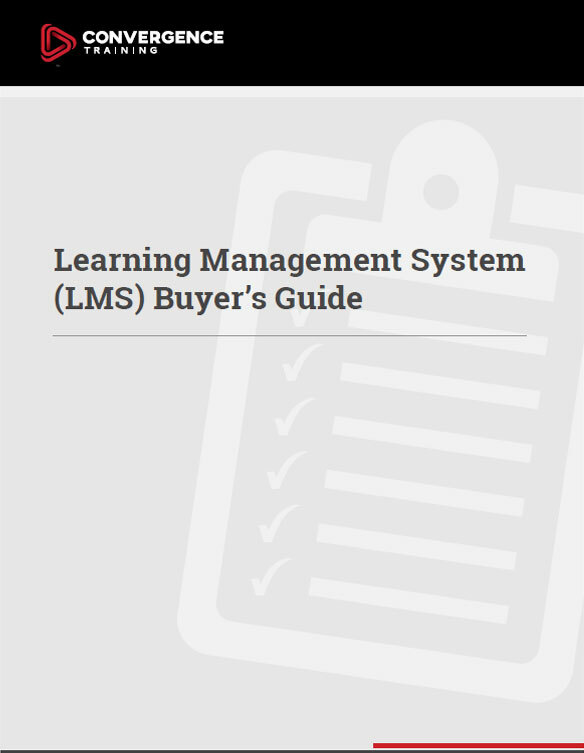 Until them, consider downloading our free LMS buyer’s guide, below. We mentioned it’s free, right? Great write-up, I’m sure a lot of people will find it handy. Even despite being a professional in that field I sometimes feel as if new terms were being invented on a daily basis, I can only imagine how tangled it must feel for some people. But it’s a world definetely worth entering – a day might come when half of the people in the subway will be learning something on their mobiles! Yeah, I’m the same as you. I sometimes get confused/need a refresher even in the areas of my “expertise.” And it’s all a bewildering alphabet soup to anyone new to the field. We try to write the occasional 101-level article like this one for those very reasons. I very definitely remember having no idea what an LMS was (even though I had used one in the past) and having no idea what SCORM was (again, even though e-learning courses I created were ultimately formatted in SCORM without my knowing).